Blaise Pascal: We know truth, not only by reason, but also by the heart. 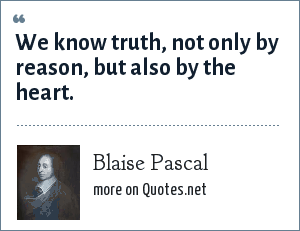 "Blaise Pascal Quotes." Quotes.net. STANDS4 LLC, 2019. Web. 23 Apr. 2019. <https://www.quotes.net/quote/38807>.